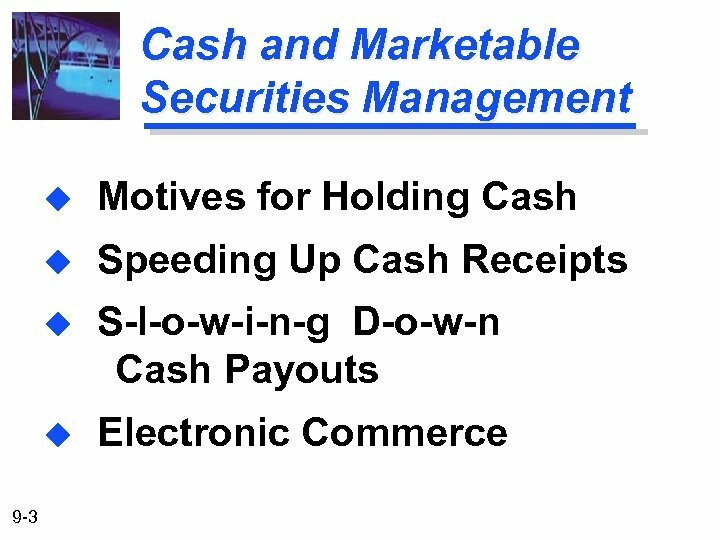 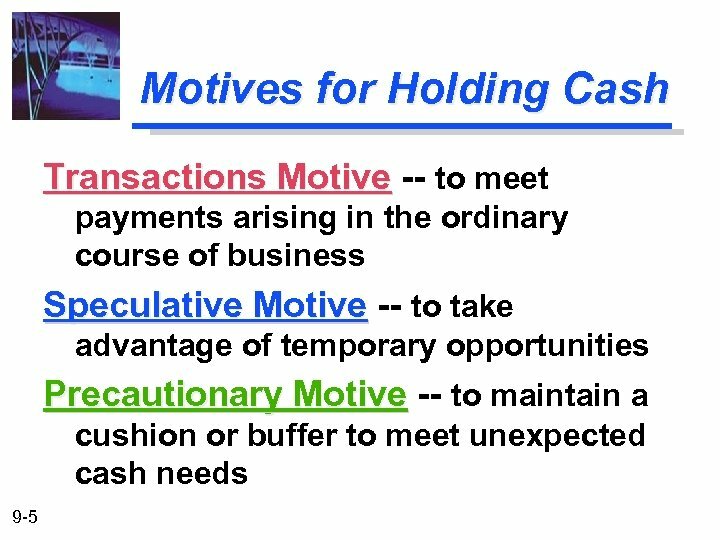 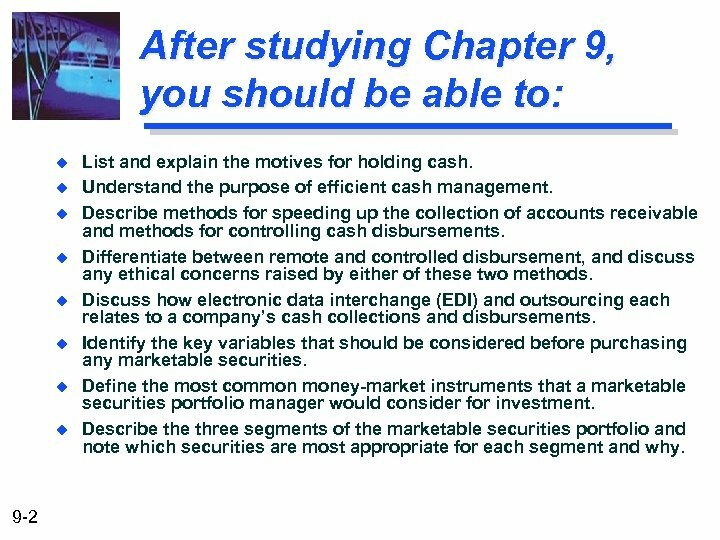 After studying Chapter 9, you should be able to: u u u u 9 -2 List and explain the motives for holding cash. 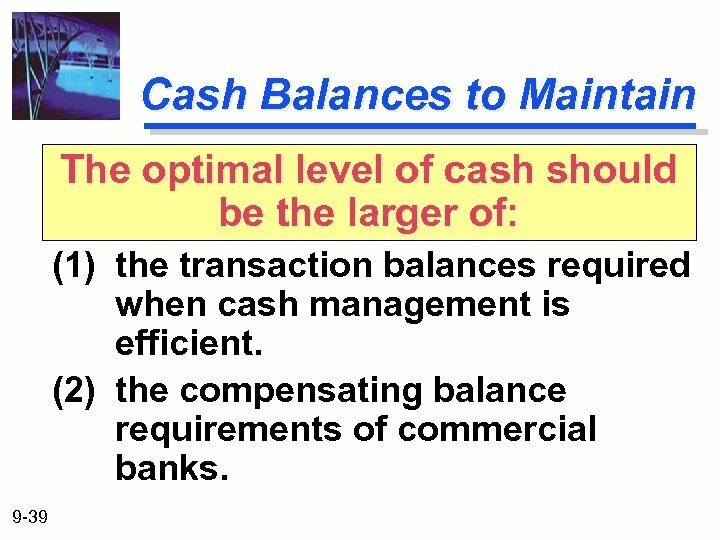 Understand the purpose of efficient cash management. 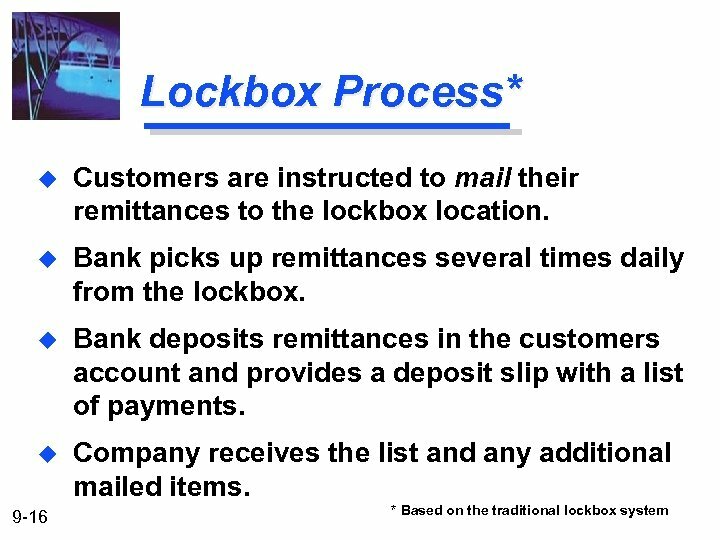 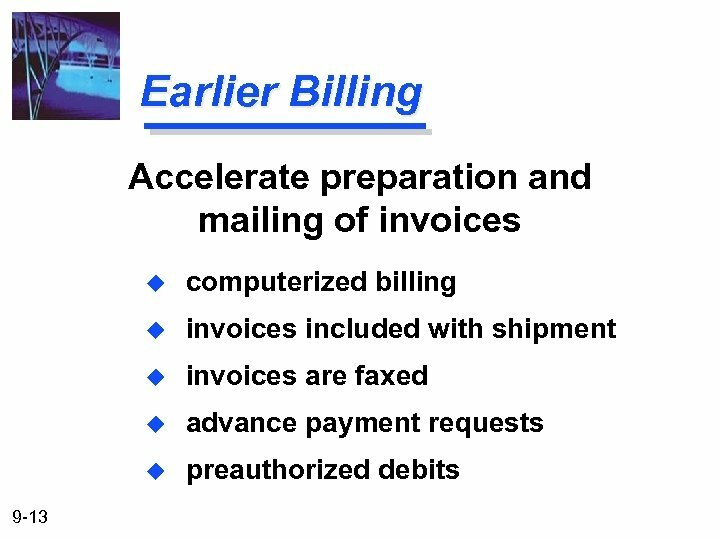 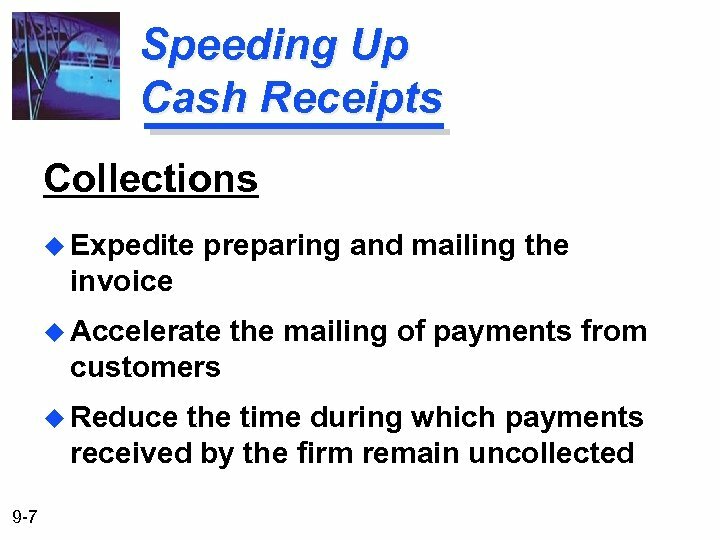 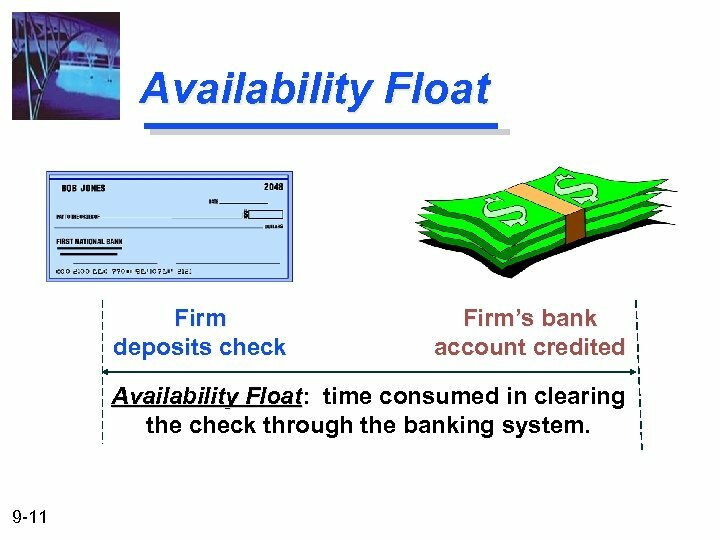 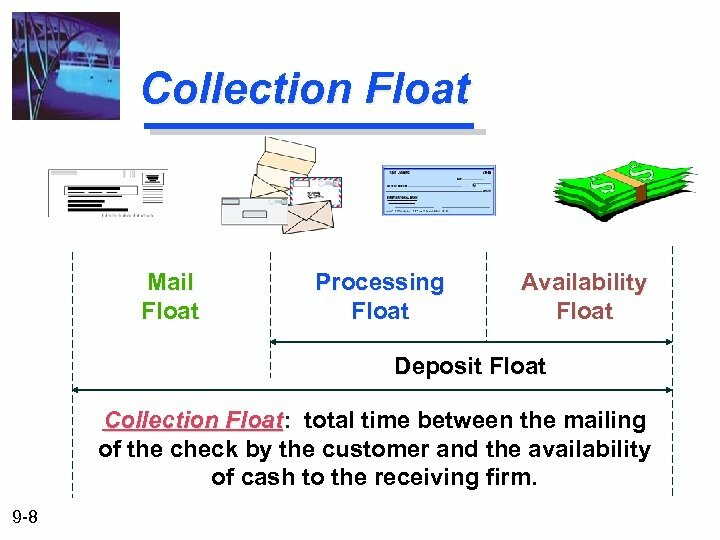 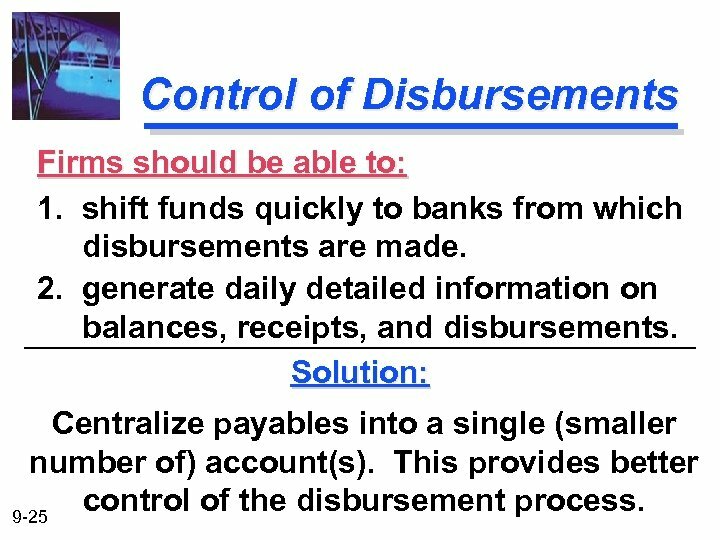 Describe methods for speeding up the collection of accounts receivable and methods for controlling cash disbursements. 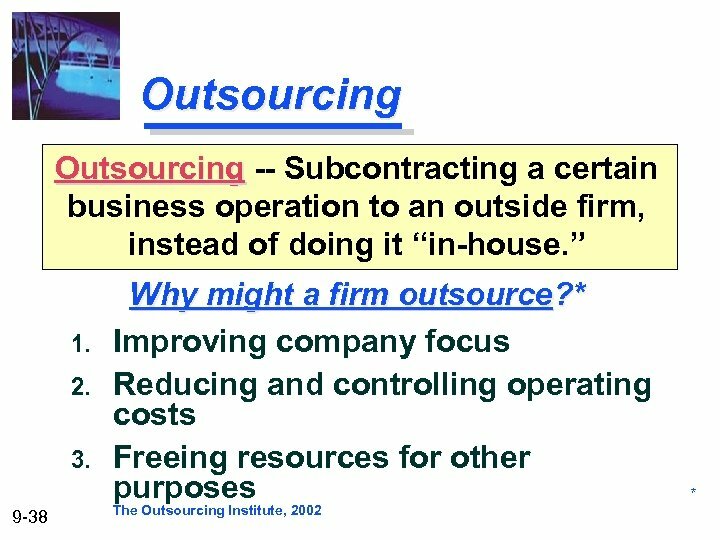 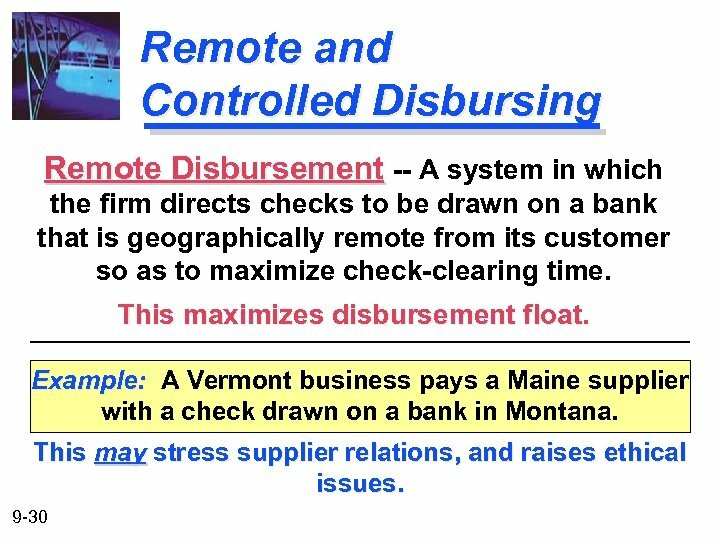 Differentiate between remote and controlled disbursement, and discuss any ethical concerns raised by either of these two methods. 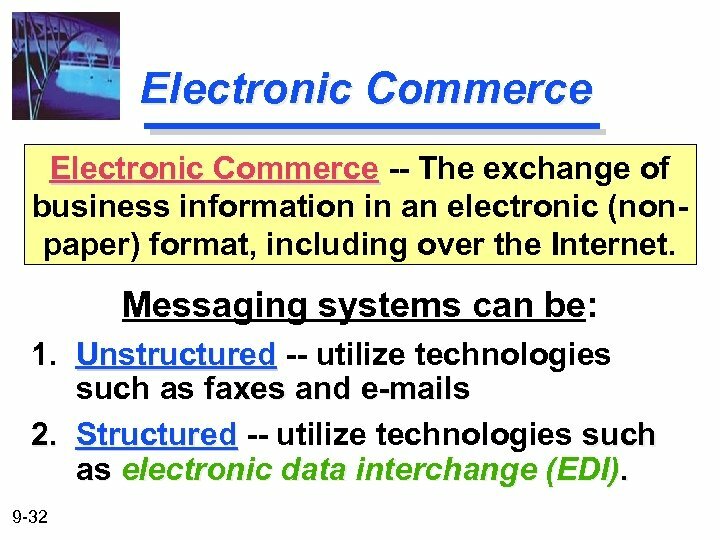 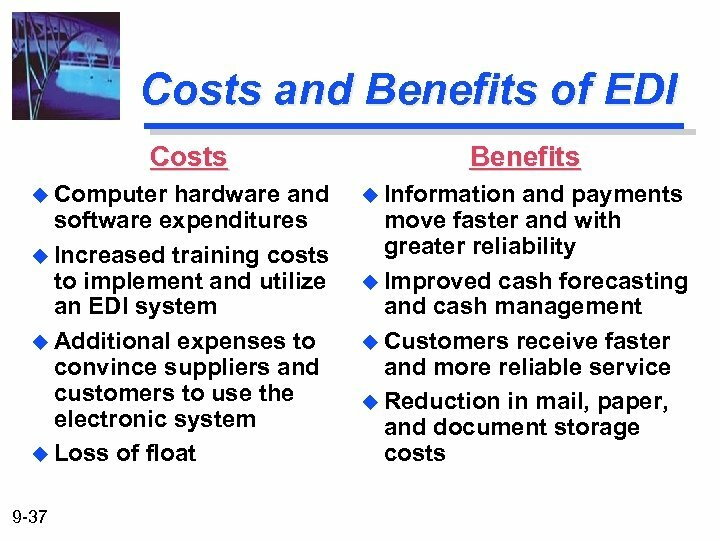 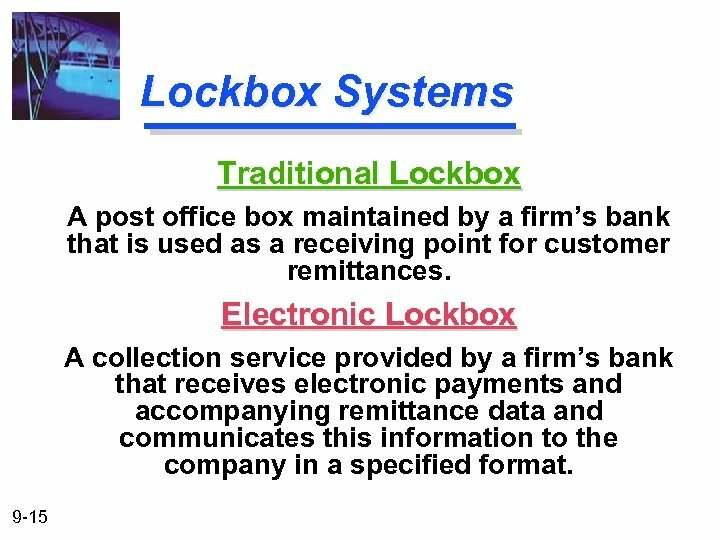 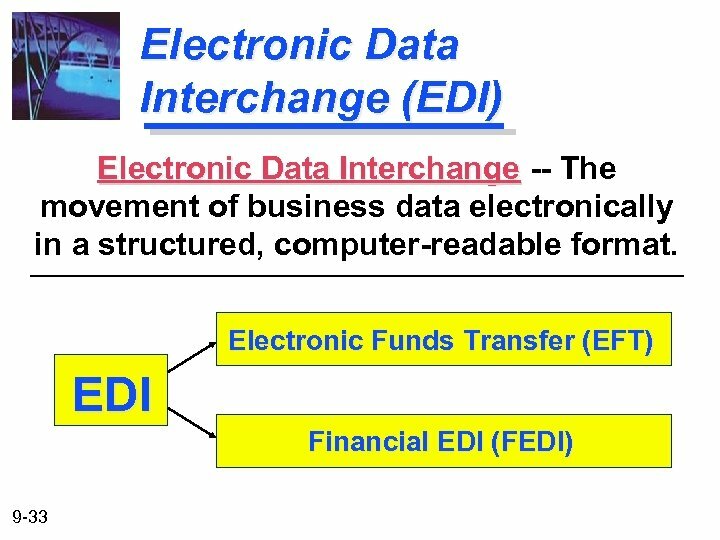 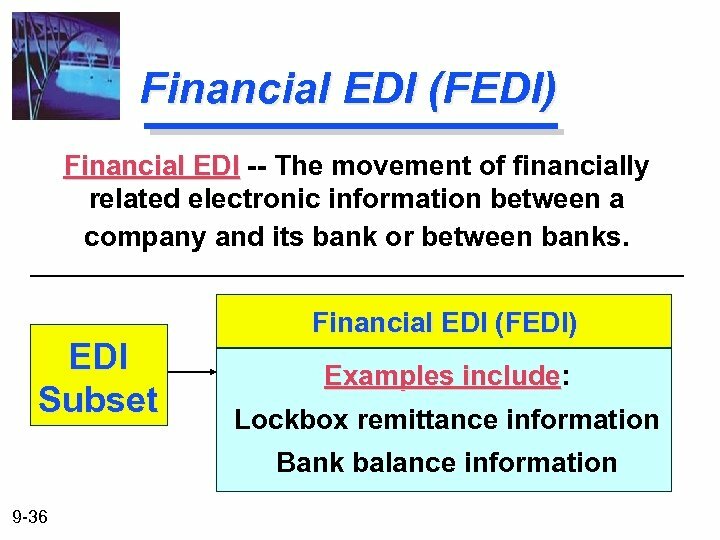 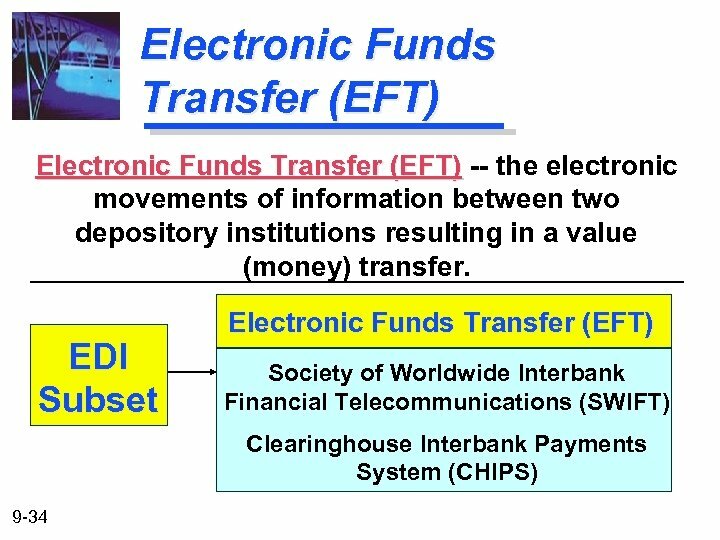 Discuss how electronic data interchange (EDI) and outsourcing each relates to a company’s cash collections and disbursements. 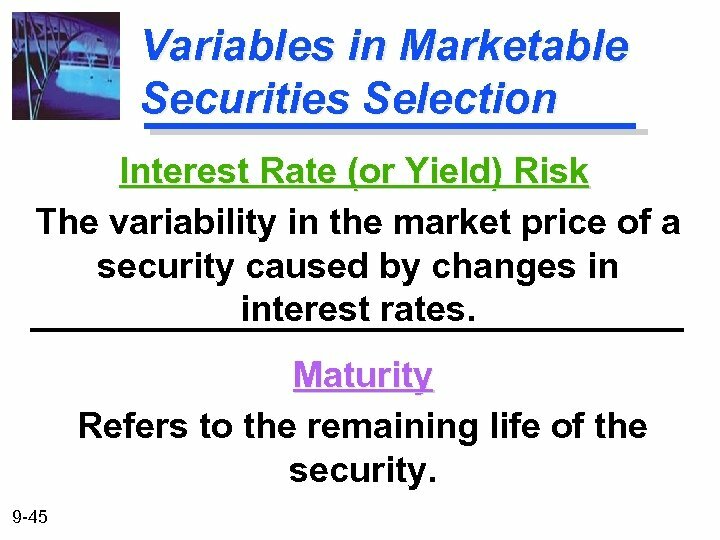 Identify the key variables that should be considered before purchasing any marketable securities. 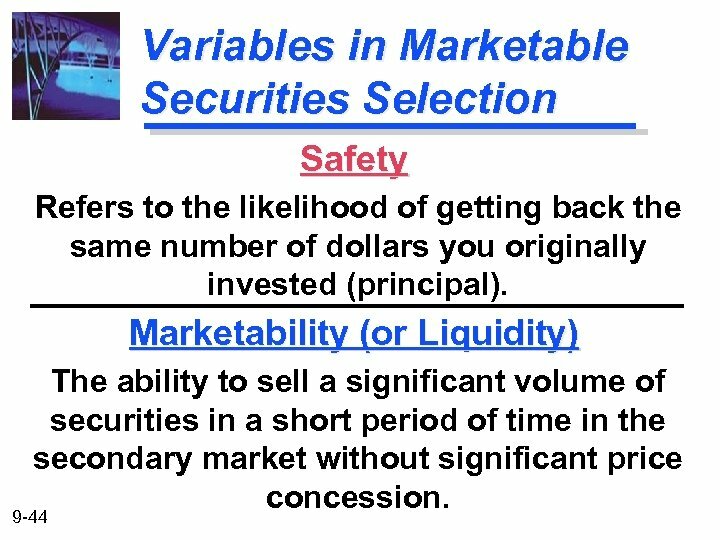 Define the most common money-market instruments that a marketable securities portfolio manager would consider for investment. 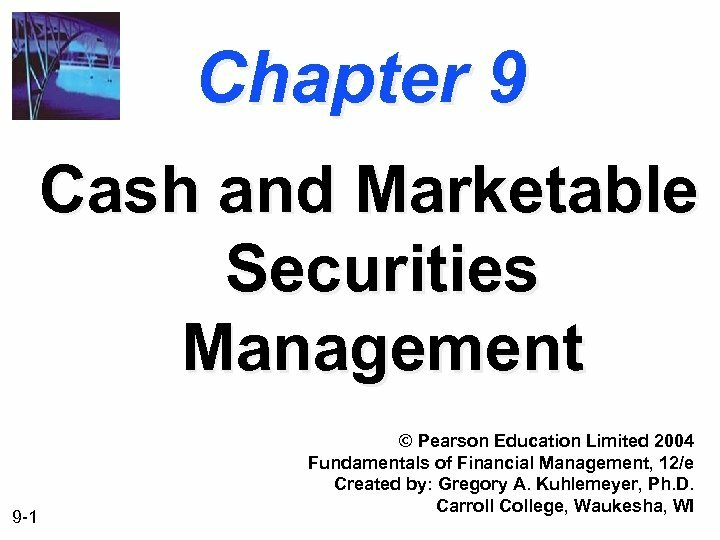 Describe three segments of the marketable securities portfolio and note which securities are most appropriate for each segment and why. 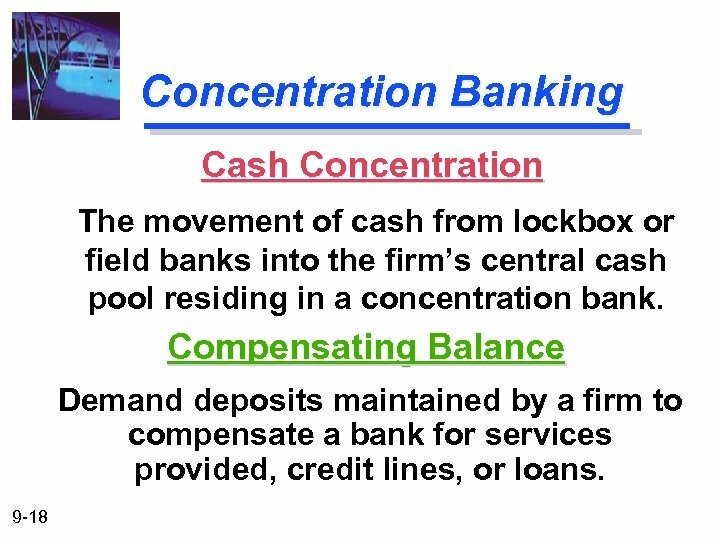 Concentration Banking Moving cash balances to a central location: u u Reduces idle cash balances to a minimum. 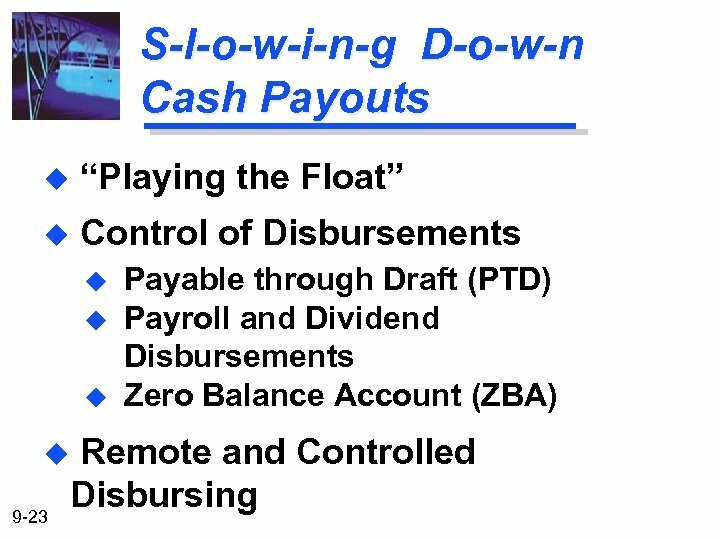 u 9 -19 Improves control over inflows and outflows of corporate cash. 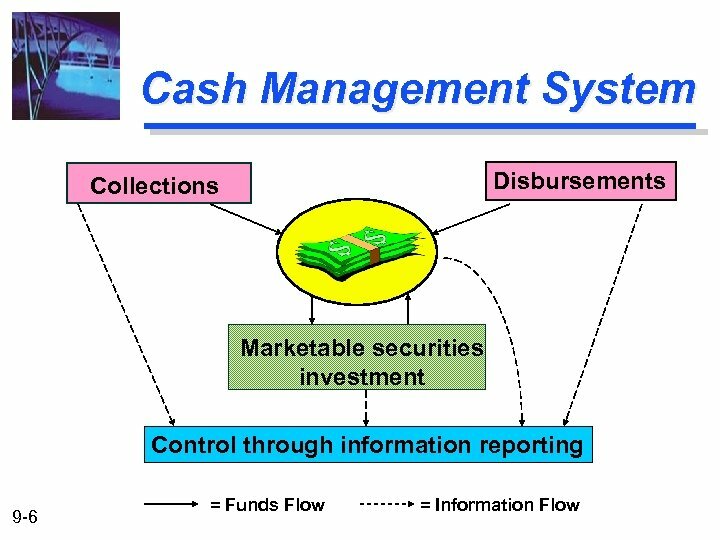 Allows for more effective investments by pooling excess cash balances. 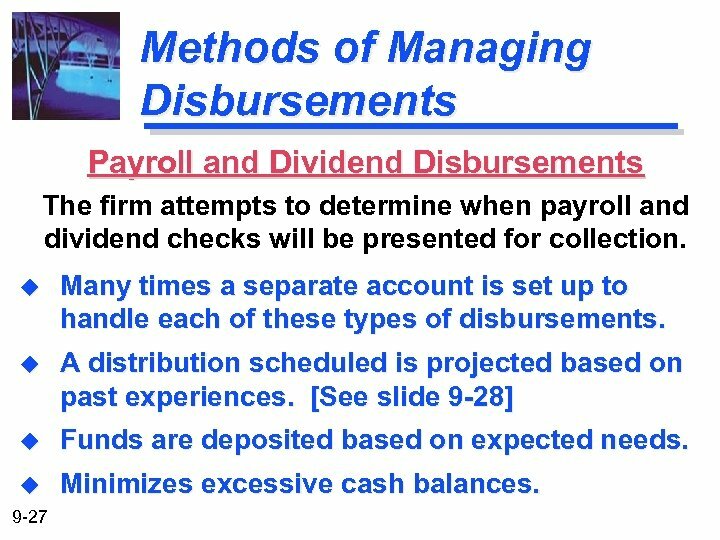 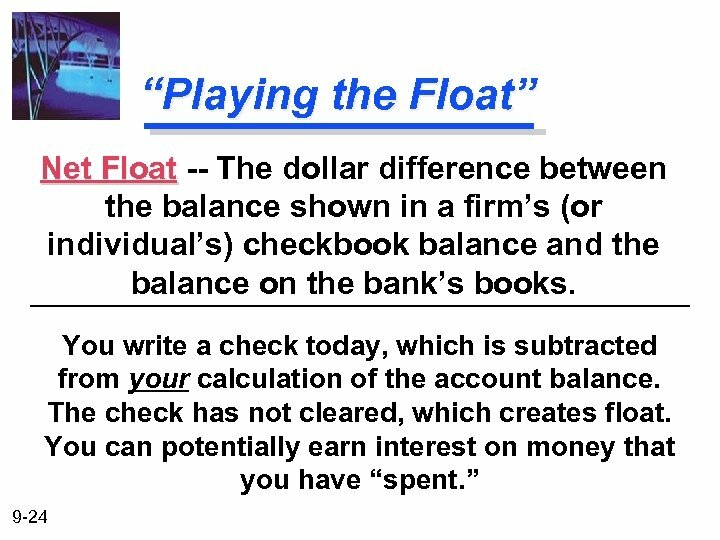 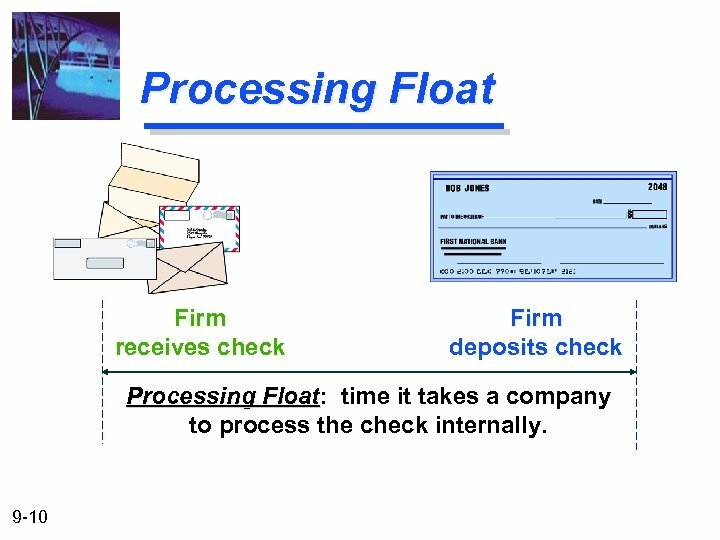 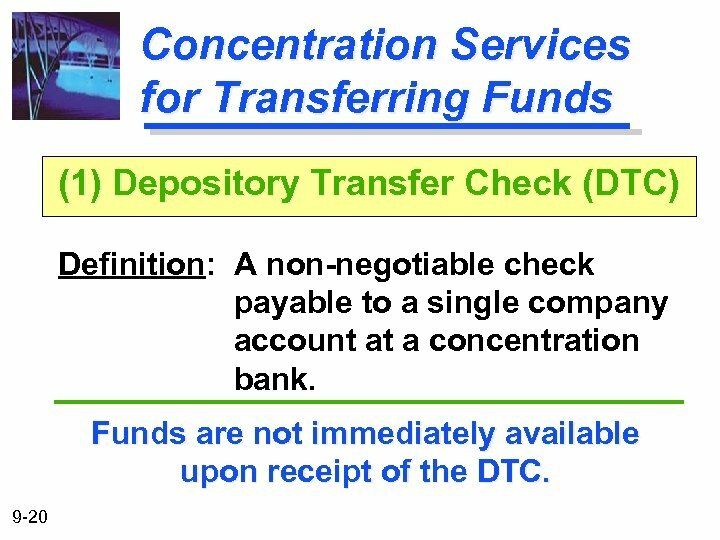 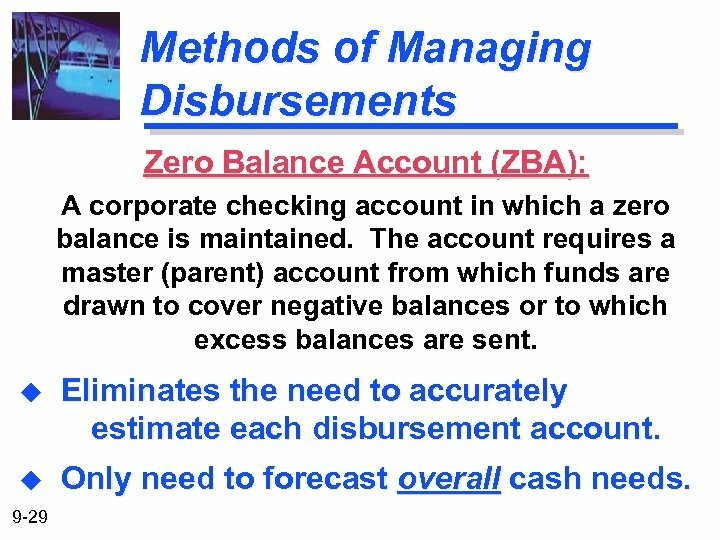 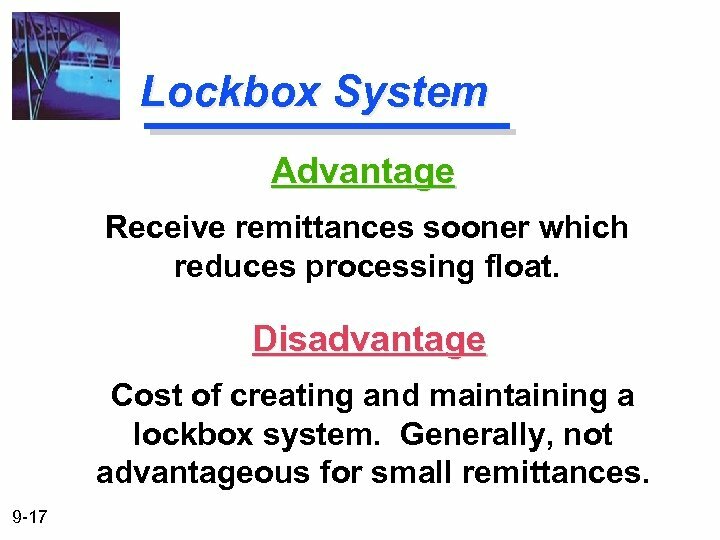 Methods of Managing Disbursements Payable Through Draft (PTD): A check-like instrument that is drawn against the payor and not against a bank as is a check. 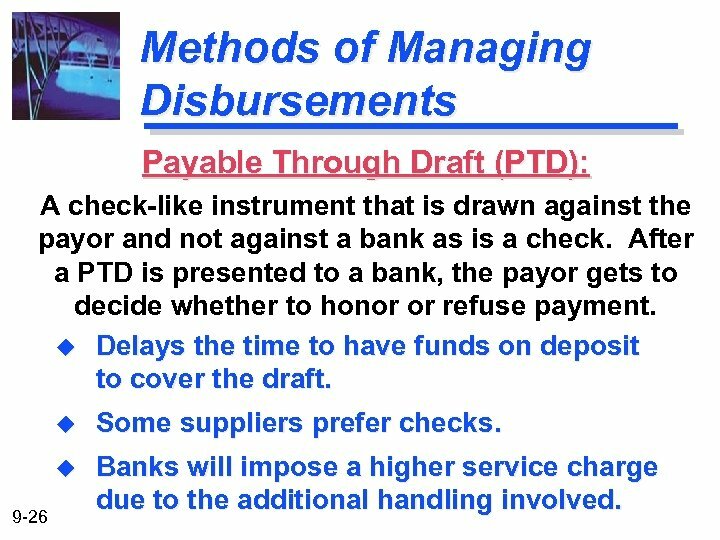 After a PTD is presented to a bank, the payor gets to decide whether to honor or refuse payment. 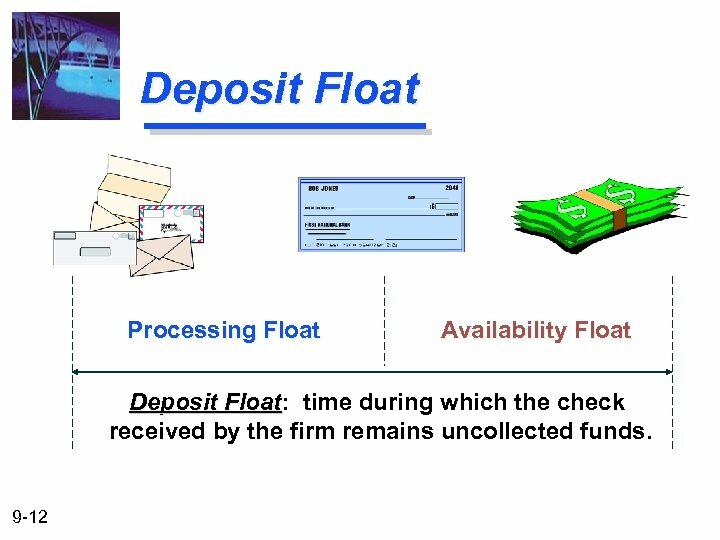 u Delays the time to have funds on deposit to cover the draft. 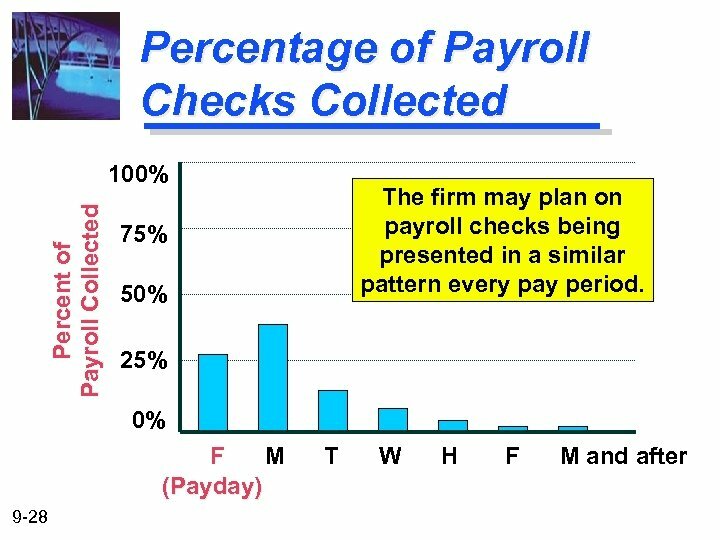 u u 9 -26 Some suppliers prefer checks. 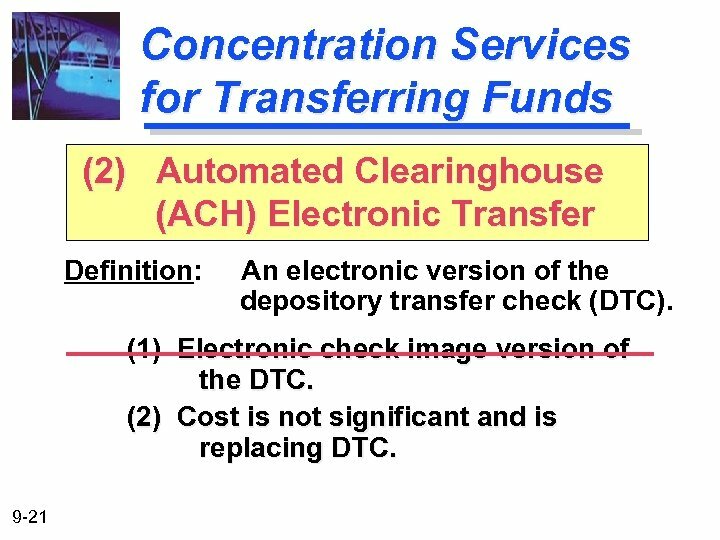 Banks will impose a higher service charge due to the additional handling involved. 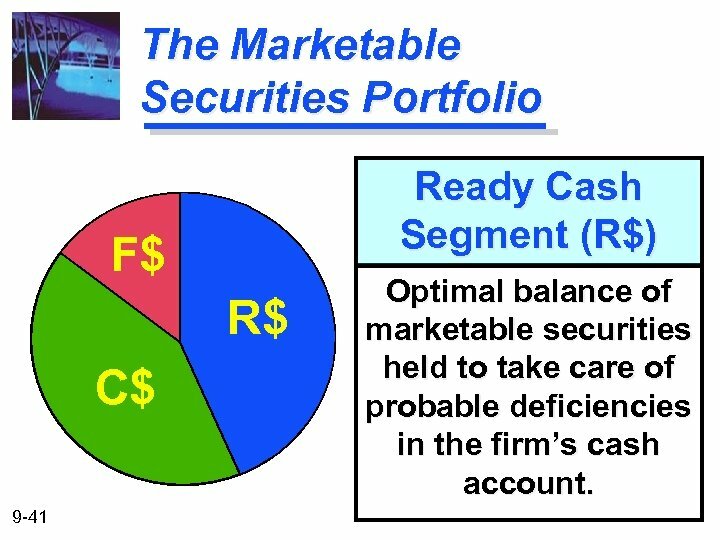 The Marketable Securities Portfolio Ready Cash Segment (R$) F$ R$ C$ 9 -41 Optimal balance of marketable securities held to take care of probable deficiencies in the firm’s cash account. 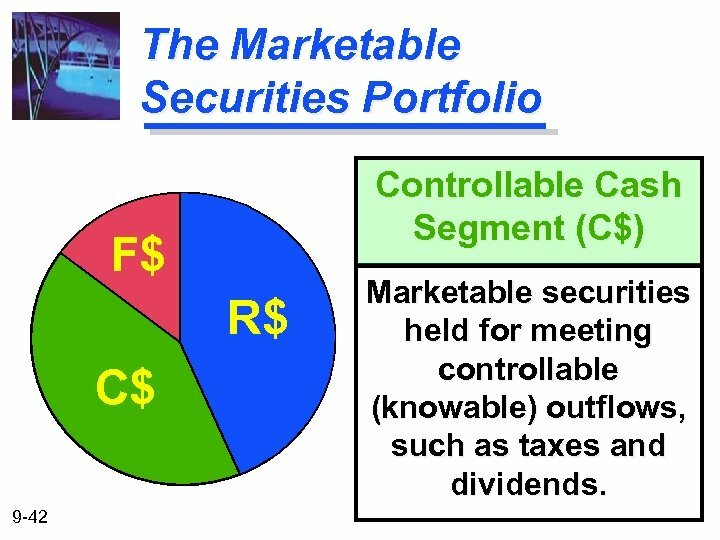 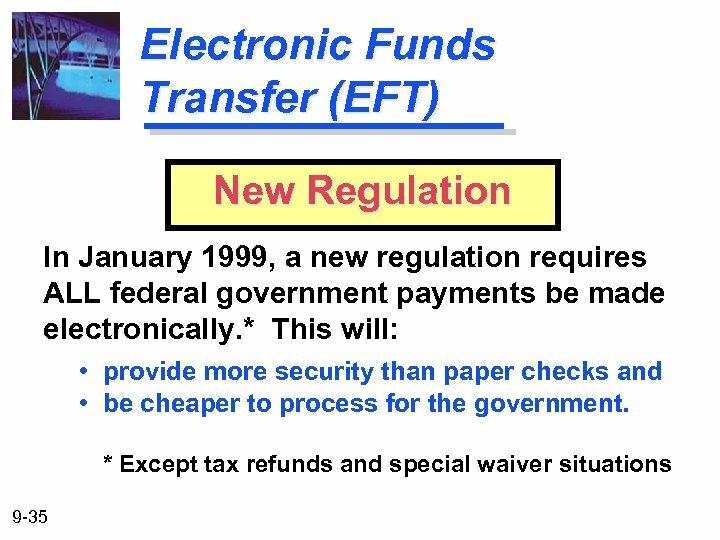 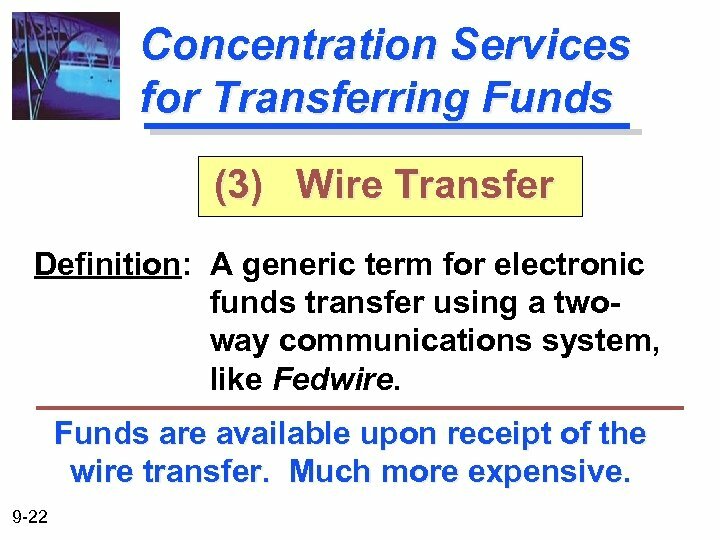 The Marketable Securities Portfolio Controllable Cash Segment (C$) F$ R$ C$ 9 -42 Marketable securities held for meeting controllable (knowable) outflows, such as taxes and dividends. 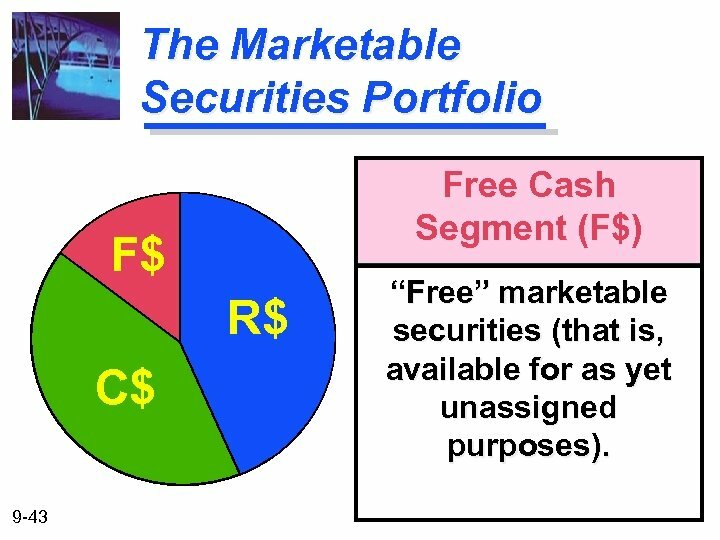 The Marketable Securities Portfolio Free Cash Segment (F$) F$ R$ C$ 9 -43 “Free” marketable securities (that is, available for as yet unassigned purposes). 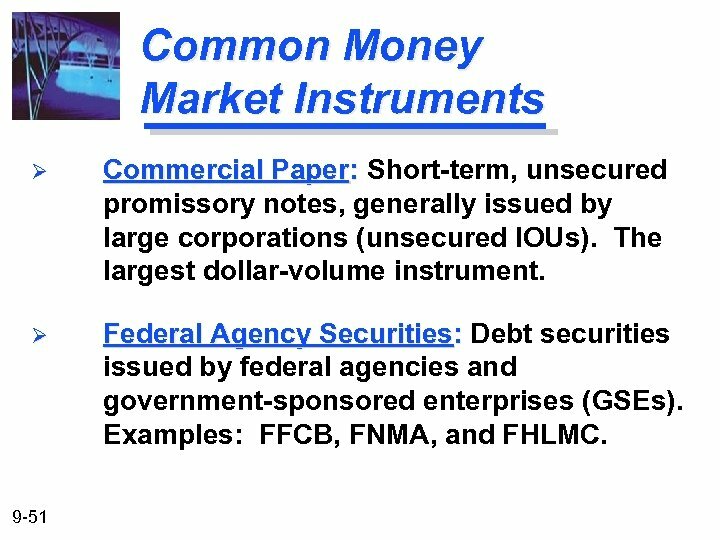 Common Money Market Instruments All government securities and short-term corporate obligations. 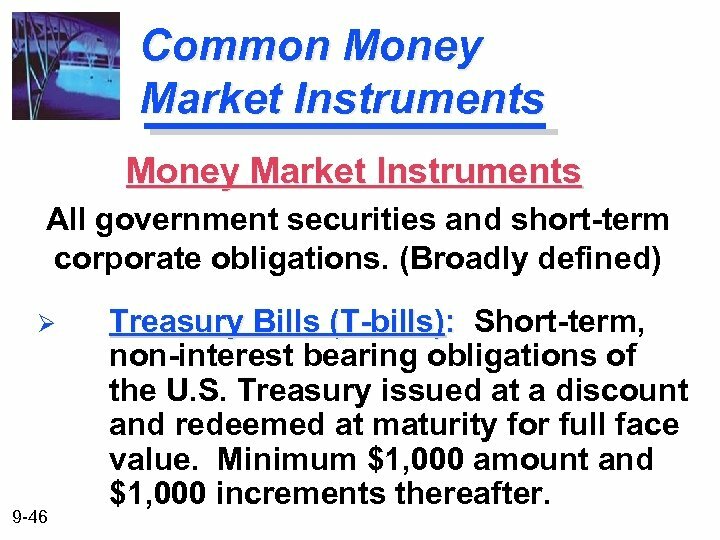 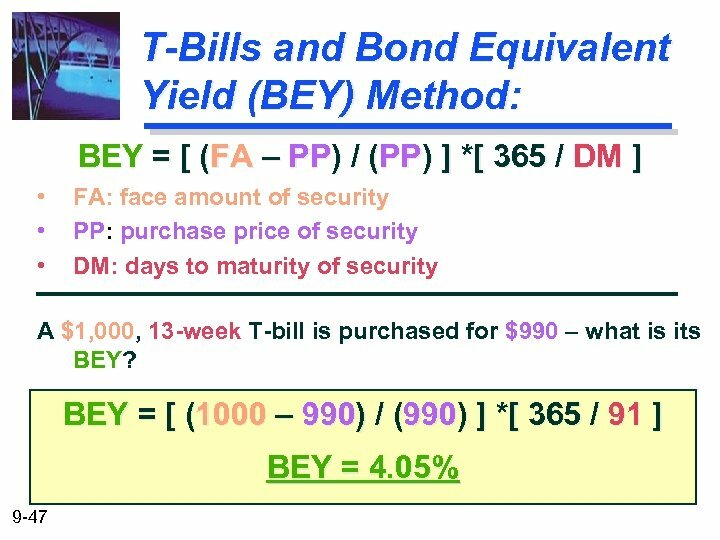 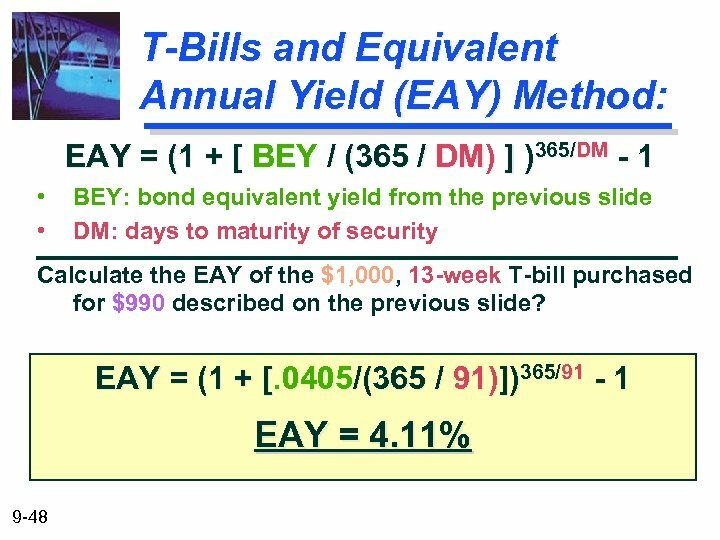 (Broadly defined) Ø 9 -46 Treasury Bills (T-bills): Short-term, non-interest bearing obligations of the U. S. Treasury issued at a discount and redeemed at maturity for full face value. 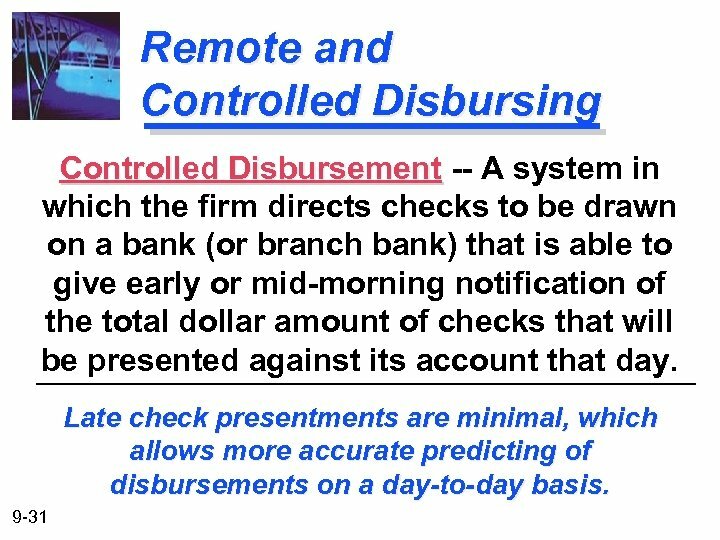 Minimum $1, 000 amount and $1, 000 increments thereafter. 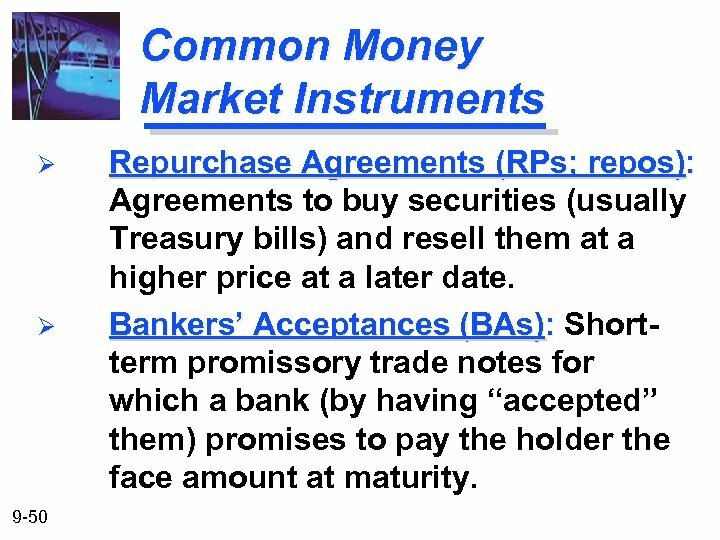 Common Money Market Instruments Ø Ø 9 -50 Repurchase Agreements (RPs; repos): Agreements to buy securities (usually Treasury bills) and resell them at a higher price at a later date. 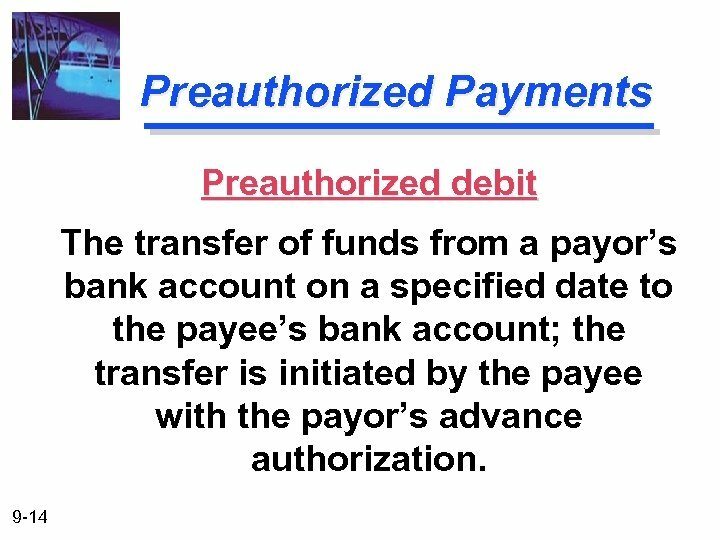 Bankers’ Acceptances (BAs): Shortterm promissory trade notes for which a bank (by having “accepted” them) promises to pay the holder the face amount at maturity. 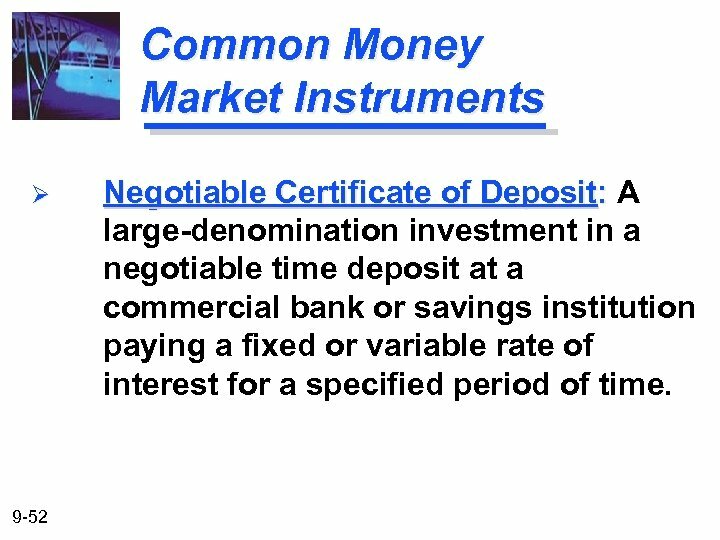 Common Money Market Instruments Ø 9 -52 Negotiable Certificate of Deposit: A large-denomination investment in a negotiable time deposit at a commercial bank or savings institution paying a fixed or variable rate of interest for a specified period of time. 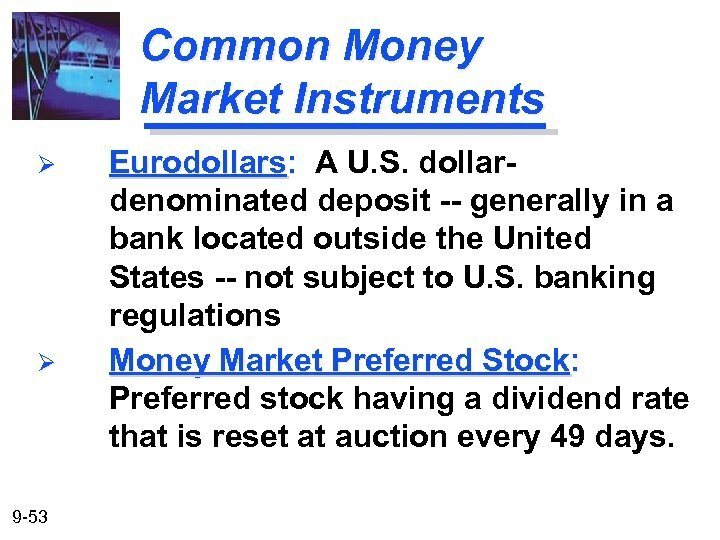 Common Money Market Instruments Ø Ø 9 -53 Eurodollars: A U. S. dollardenominated deposit -- generally in a bank located outside the United States -- not subject to U. S. banking regulations Money Market Preferred Stock: Preferred stock having a dividend rate that is reset at auction every 49 days. 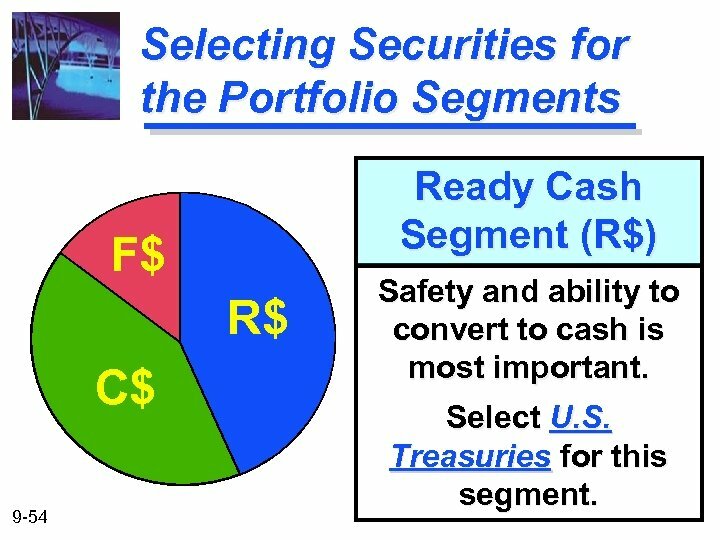 Selecting Securities for the Portfolio Segments Ready Cash Segment (R$) F$ R$ C$ 9 -54 Safety and ability to convert to cash is most important. 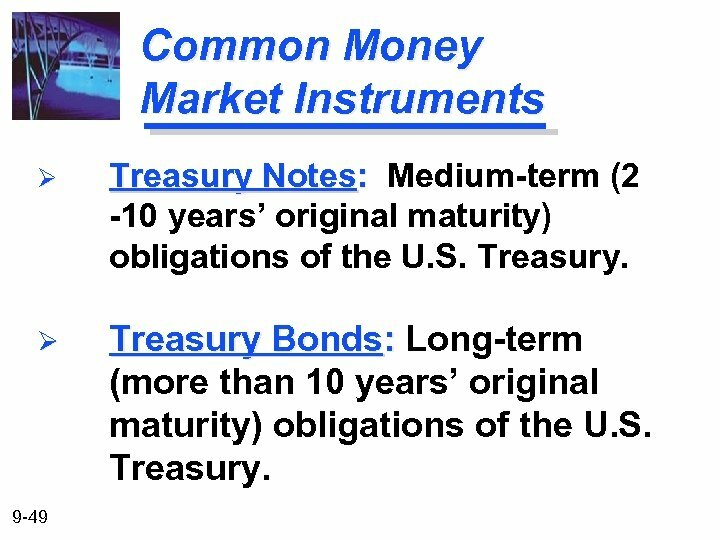 Select U. S. Treasuries for this segment. 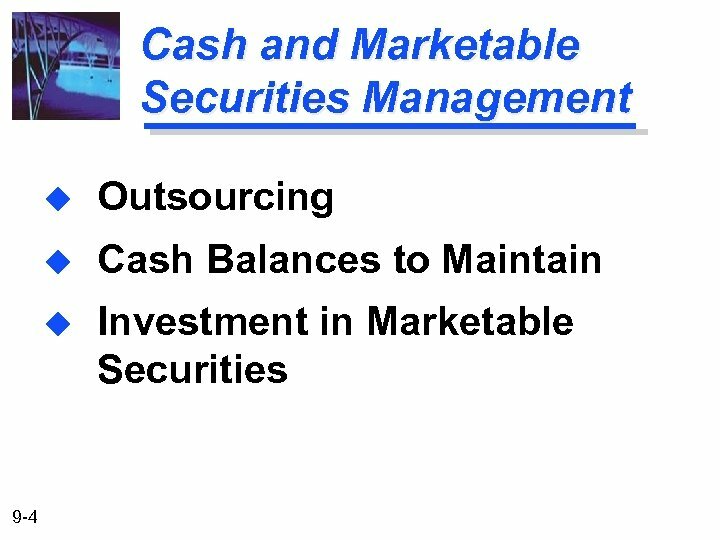 Selecting Securities for the Portfolio Segments Controllable Cash Segment (C$) F$ R$ C$ 9 -55 Marketability less important. 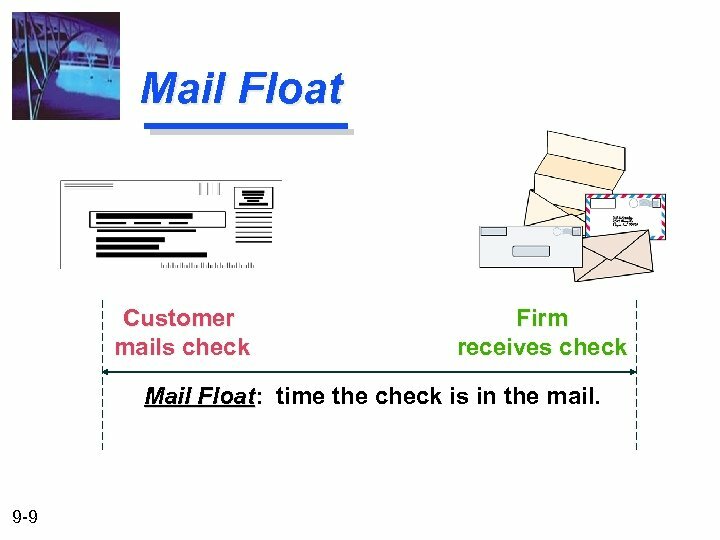 Possibly match time needs. 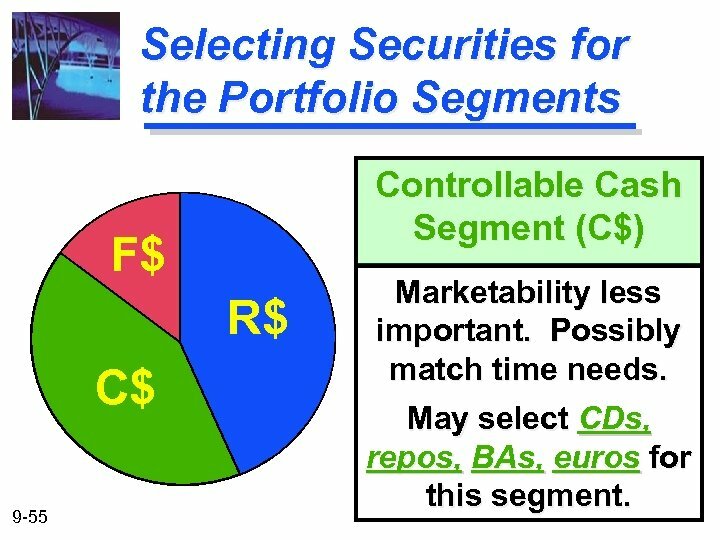 May select CDs, repos, BAs, euros for this segment. 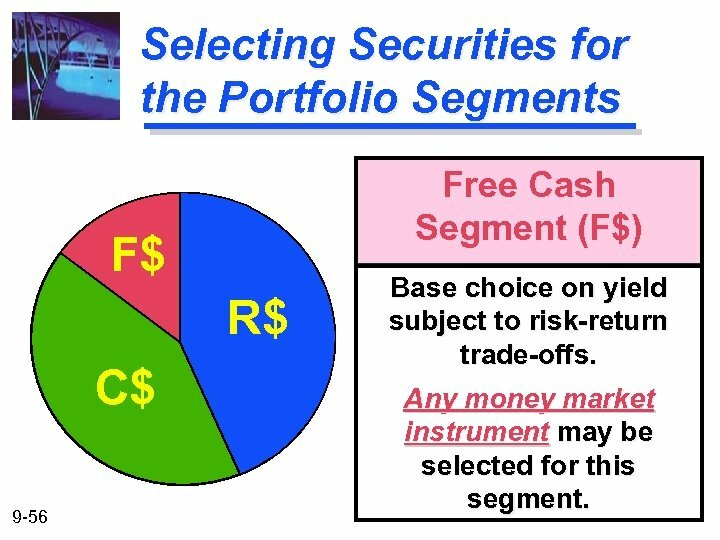 Selecting Securities for the Portfolio Segments Free Cash Segment (F$) F$ R$ C$ 9 -56 Base choice on yield subject to risk-return trade-offs. 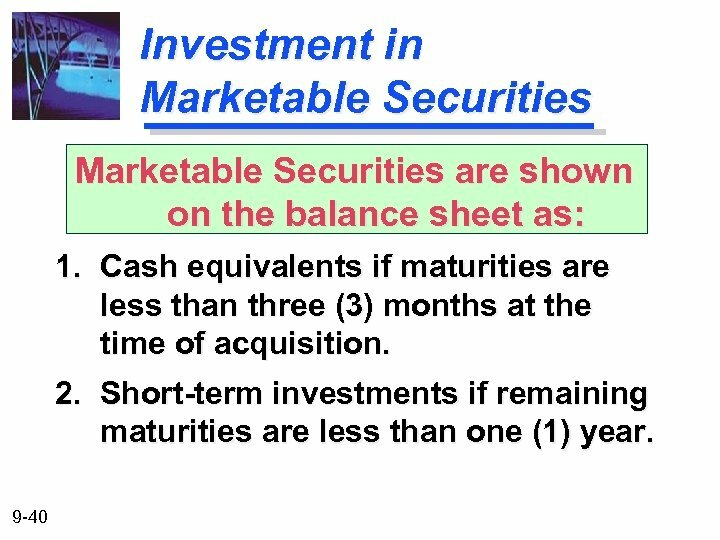 Any money market instrument may be selected for this segment.